This morning, we worked on another handy little combination technique. or "renraku waza" (to see any other renraku waza I blather about, just click on "judo renraku waza" on the lower right of the page under "labels"). We started with the individual components, first working on okuri ashi harai, which we typically do from a "step around", turning entry. Next, we practiced hiza guruma for a bit. Then, we looked at the condition where hiza doesn't quite work out. When uke steps through it, you catch his trailing leg with a foot sweep. 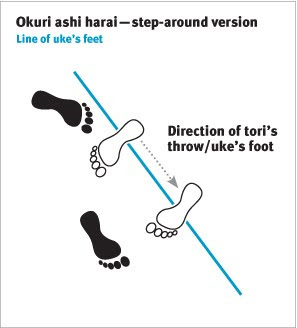 Now, when this happens, depending on certain factors, you may catch both of uke's feet for okuri ashi harai, or push his trailing leg behind his support leg for more of a harai tsurikomi ashi (I'll explain in a sec). Frankly, you don't really care, so long as you sweep the guy's foot. When we do the step around version of the double foot sweep, we would normally like to place the foot that ultimately going to do the sweeping pretty close to uke's foot (three feet on a line, toes pointed at uke). That way, your foot can find uke's easily when it comes time to follow it for the sweep; it also gets you closer to uke so you're not leaning back in order to reach him. But when you start with hiza, that foot (which is supporting you while the other is doing hiza) is typically quite a ways away from the foot you're about to sweep. I've also been playing with doing kosoto gari as a follow up to hiza guruma, which seems to work pretty nicely. Basically, I take the foot that I tried to do hiza with and instead of putting it down turned outward, I put it down turned inward. It's kind of hard to describe in words, so I'll try and get a video of it. Now let's say hiza didn't work and then the foot sweep didn't work, either. If you tried hiza with your right foot and tried the foot sweep with your left, it's now time to put your left foot down. Probably the easiest thing is to put it down across uke's line and step into osoto gari. 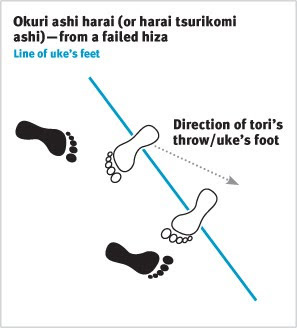 This tends to work when you made contact with uke's foot for the sweep, but it got stuck on the mat. When uke sees the double foot sweep coming and intentionally pulls his foot back and out of the way (so you miss altogether), try stepping with your left foot deep into that space, the foot turned outward for a rear corner o goshi (I'm tall, so I throw my arm over uke's shoulder and it looks more like koshi guruma rather than o goshi). Shorter folks, may step in for ippon seoi nage. (Again, I think I'm going to have to put this on video, I think). The way I normally do it, I use my right foot to prop uke's left knee for hiza. I put that foot down, toes pointed inward (which turns my body slightly to my left), and then use my left foot to catch uke's right foot in kosoto, which is just beginning to pick up and move. Hope that helps, but I'll definitely get it on video soon!